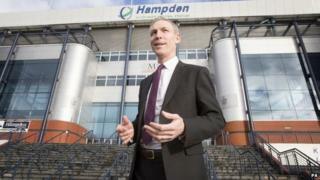 Scottish Labour leader Jim Murphy has been meeting football clubs and supporters' groups to discuss lifting the ban on alcohol at grounds. He was also due to hear from representatives of the Scottish Football Association (SFA) at a summit at Hampden Park in Glasgow. Mr Murphy would like to see the ban on alcohol lifted. But First Minister Nicola Sturgeon said she was far from convinced about changing the practice. Labour announced plans for a consultation on the issue at the weekend, with Mr Murphy arguing fans were "paying for the sins" of the 1980s. The ban was initially imposed after a riot at the 1980 Scottish Cup final between Rangers and Celtic but alcohol can be served in corporate hospitality areas of football stadiums. Celtic fan Mr Murphy's call echoed that of Scottish Conservative leader Ruth Davidson, who first urged a review in September 2013. Her party has carried out a survey of all clubs in the Scottish Professional Football League which suggests that 85% of the 26 clubs that responded wanted an end to the drink ban. However, in The Herald newspaper, health experts, domestic violence awareness organisations and academics signed a joint letter calling for the restrictions on the sale of alcohol at football matches to remain. Ms Sturgeon said she was concerned that removing the ban would be the equivalent of "taking a step backwards". Police Scotland Chief Constable Sir Stephen House said he would be "extremely concerned" at any proposal to change the law, but that if a consultation found public support for the idea then police would enter into formal discussions with the footballing authorities. Scottish Green Party co-convener Patrick Harvie and Scottish Liberal Democrat leader Willie Rennie have both spoken of their opposition to allowing alcohol in football grounds. The SFA has already been consulting with fans on the issue of whether alcohol should be sold at stadiums during matches and will also seek to gauge the views of the public and non-football fans.